In 2018, Schaller paves the way for the next generation of revolutionary strap locks. Schaller proudly presents: The new S-Locks, S for save, S for silent and S for Schaller strap locks. These new revolutionary S-Locks are silent. They feature one-piece hardened steel strap buttons, aesthetic design, perfect handling, an elegant Lock-Wheel and all former hiccups have been tackled. 3 pieces = 1 S-Lock - perfect. 1. Screw the lock wheel with patented self-locking thread tool-free by hand, you already protect your guitar sufficiently (the round shaping must be facing the pull-up ball). 3. Use the micro cone-top screw to attach it permanently. You will never lose your wheel again. Finally put all parts together and just listen carefully…Give it a shake, give it a roll and prepare to be amazed: It is silent. 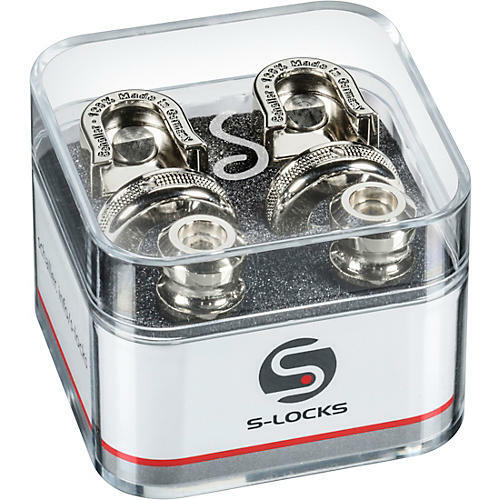 All S-Locks come in a new and attractive reusable crystal box. 1. S-Locks are fully compatible with all existing Schaller Security Locks. 2. Only one strap and one pair of S-Locks, …for all your guitars. Enjoy all the benefits of the new S-Locks using one single strap. Simply use the new strap buttons replacement kits to new S-Locks for all your instruments.